Discussion in 'Hommes' started by lanvinray, Nov 6, 2009. How discovered: A friend of mine introduced me to a fellow photographer (Gaetan Caputo), who sent some pictures to IMM. Next thing I know, I’m getting a call from IMM and things got started. Favourite things: My Mac, my bed, my ever expanding DVD collection, books, backpacking, concerts and swimming. Favourite music, band: Almost anything, going from classic to dirty electro and rock. Anything but RnB and schlager music. Hobbies: Theatre, photography, filmmaking, soccer, reading and eating. Favourite piece of clothing: A bathrobe and a nice pair of warm socks. On the other hand, I love tuxedos. Favourite artist (any kind): Quentin Tarantino, Stanley Kubrick, Francis Ford Coppola, Steven Spielberg, Christopher Nolan, Christian Bale, Anthony Hopkins, Jack Nicholson, Salvador Dali and about a million more. Currently you're obsessed with/about: My new camera and the latest film project I’m working on. he's gorgeous and from my hometown, woohoo ! 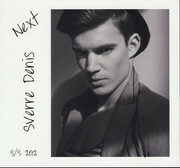 He caught my eye in models.com too! Gorgeous! groomed by Daisy van Winkel and shot by Zeb Daemen. I was thinking the same (bone structure)... I despise the tan, though!